As the worldwide leader in supplying Hole Products, McNICHOLS offers packaging, shipping, and delivery as part of the complete service experience. You are also welcome to pick up your order at any of our 19 Metals Service Centers nationwide, should you prefer that method. Our associates take great care in packaging your order and ensuring it is delivered on time via your method of choice. Given the wide array of Hole Product sizes and shapes available, we offer a variety of delivery methods. McNICHOLS associates are prepared to discuss these options with you. In some instances, you may prefer our confidential shipping option. At your request, we will use unmarked packaging and paperwork (no McNICHOLS branding) and ship the order in your name to protect the relationship you have with your customer. We are happy to coordinate logistics for delivery to your job site or a location of your choice. If you have special loading or unloading requirements — if your location does not have a dock, for example—we work with you to ensure safe delivery of your selections. McNICHOLS complies with the highest industry standards for shipping, as our ISO 9001:2015 certification attests. Wherever you are, whenever you need us, you can count on reliable, fast delivery! For shipments on pallets/skids, a cardboard pad known as a “skid top” is placed on top of a pallet. Sheets/panels are placed on a cardboard pad that wraps around the material and then secured. To help prevent damage, the size of the product or material will not exceed the pallet size. Multiple skids will be used if necessary. Skid tops separate different types of materials to prevent contamination. Skid top/packing paper also separates product types for easy identification. Cardboard will be added to the top of flat products for protection during transit. Corner boards are added to protect the edges of the material in transit. All bundles are skidded or sledded at each end. The material will not overhang or exceed the skid or sled. Lighter and shorter material will be positioned on top of any heavier or longer material. Skids or sleds are banded at least twice and often three times to properly secure the material. Box Shipment Standards: Material will be placed in a pre-constructed box or the box will be formed around the material. If your order is for McNICHOLS® Handrail Components or Fittings, those items are placed in a bag and then secured in a box with the appropriate filler to prevent the product from shifting during transit. Shipping within the United States and Canada: Perforated Metal, Expanded Metal, and Wire Mesh sheet products typically ship on a skid or pallet. Sheets weighing less than 140 pounds with a one-day transit point may be shipped in a well-packaged carton. 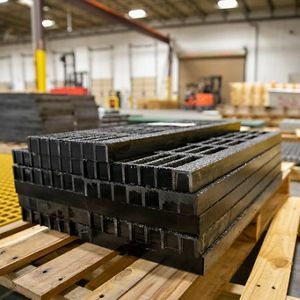 Perforated Metal and Wire Mesh coils or rolls, Bar, Fiberglass, and Plank Grating, as well as other non-flat or non-standard size material may ship on a skid/pallet, and are bundled or secured with additional packaging materials depending on product dimensions. International Shipping: Our international shipping procedures will vary by type of product, material, carrier, and destination. One of our Customer Service Specialists will be happy to share more information related to our shipping standards on international orders. Please allow us to serve you soon! We very much look forward to helping you and/or your business succeed!